There are 17 plants in the study, 14 pollinator friendly plant and 3 control plants. The focus will be on low cost, easy to grow plants enabling as many people as possible to help provide more foraging opportunities for our pollinators. Summer-flowering varieties have been chosen as summer is the period in which the bees need the most help. During the summer season the bees fly further to flowers because of a shortage of foraging plants they need for food. We hope to show that, by choosing the right plant varieties, a garden can be both attractive to bees and other important insects and full of beautiful flowers. Borage, Borage officinalis, is an annual plant which grows very quickly from seed. It reseeds and so can easily be grown the next year simply by allowing the seedlings to grow or it can also be transplanted. 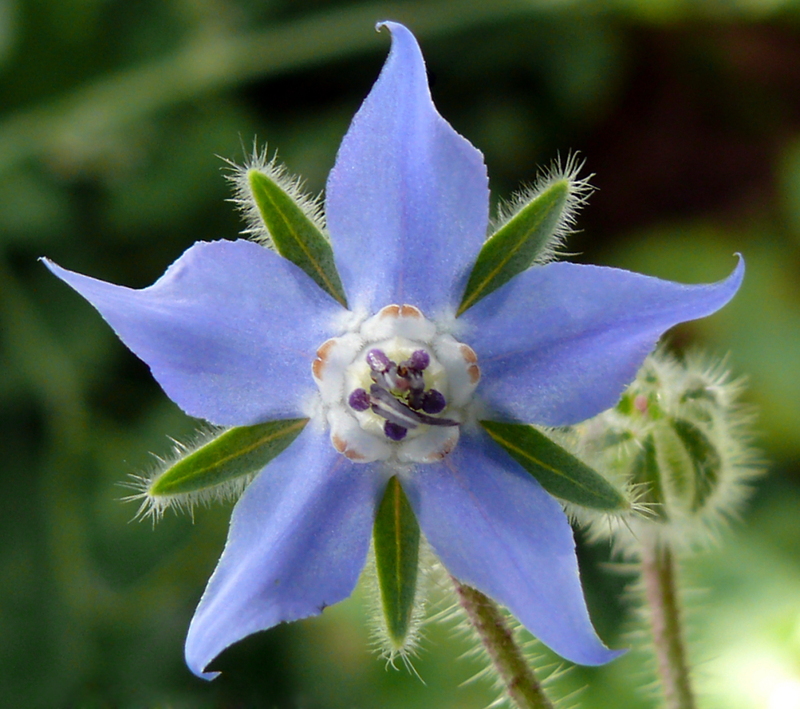 Borage is especially attractive to honey bees but also attracts bumble bees, wild bees, and butterflies. Buddleia, Buddleia davidii, is from China. It is very attractive to many butterfly species, including “Large White”, “Comma”, “Red Admiral”, “Peacock”, “Small Tortoiseshell” and “Painted Lady”. It also attracts some other insects, but very few bees. It is a fast growing bush and, if kept low, will also attract other butterfly species that prefer to forage near the ground. From a distance Catmint, Nepeta, looks like lavender. It attracts mainly bumble bees but also some butterflies and moths. It is little visited by honey bees as the flower tube is a bit long for the honey bee’s tongue to reach. 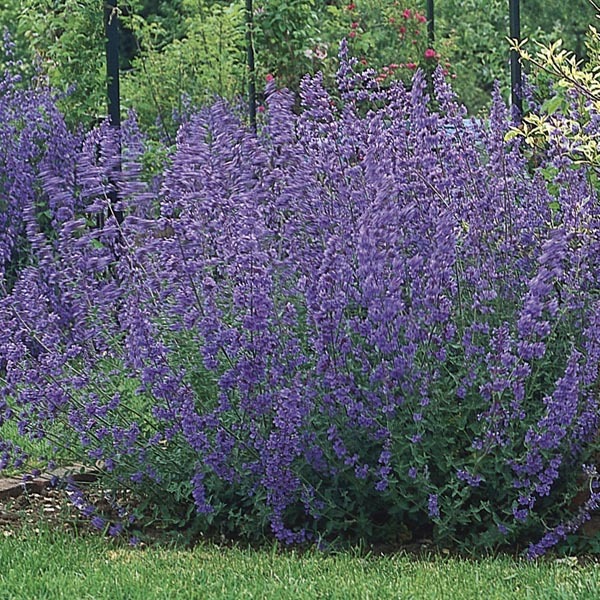 Catmint is a perennial herb that is very easy to grow and propagate by division. Like Marjoram, Catmint can smother out weeds. It has a long bloom period from late spring to the end of summer. Dahlia, Bishop of Llandoff, is one of the varieties with open flowers. The Dahlia varieties with open flowers attract many bees and other insects as their pollen and nectar are easily accessible and produced in large amounts. Bishop of Llandoff attracts mainly bumble bees but also honey bees and a few butterflies and other insects. 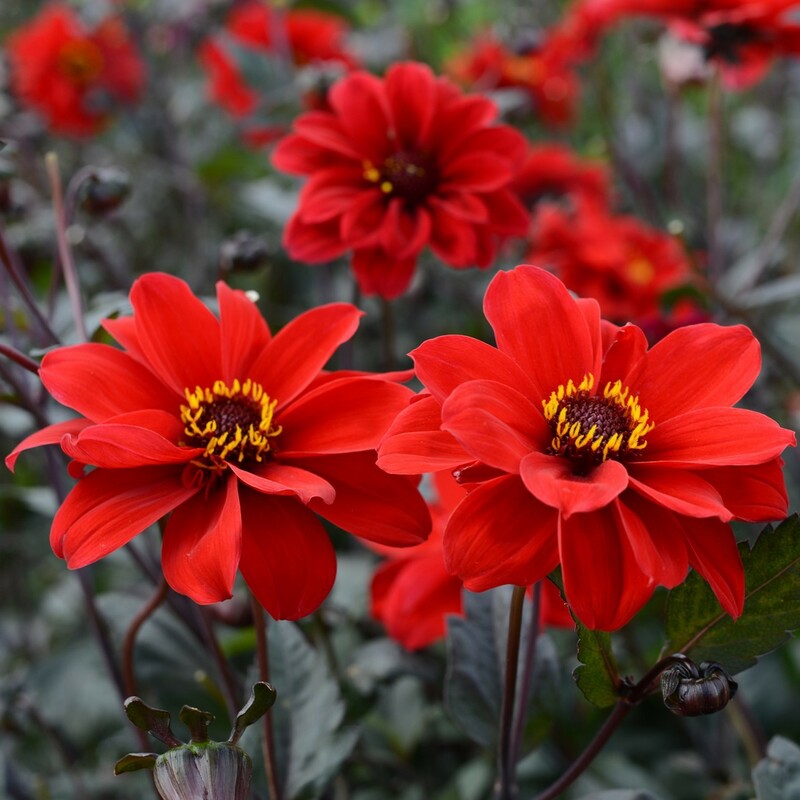 Dahlias are from Mexico and grown from tubers, which are normally lifted after the first frosts and replanted the next year. 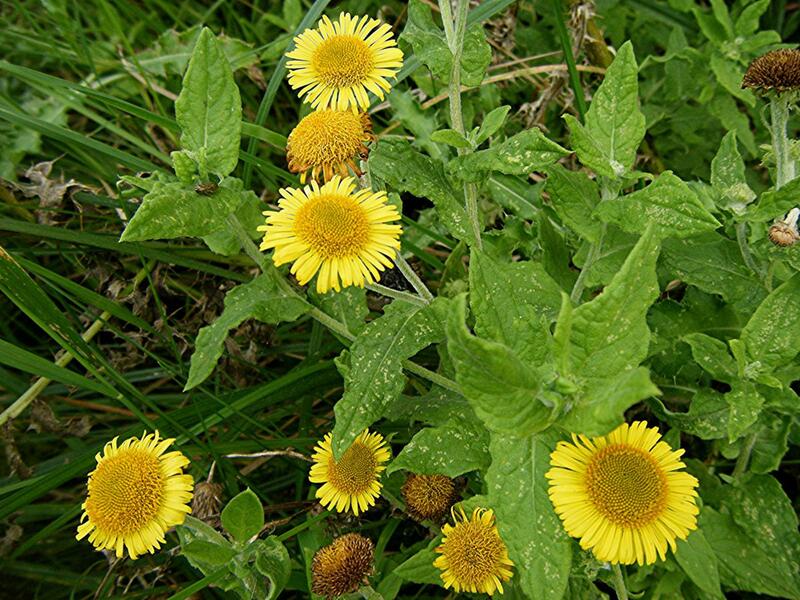 Fleabane, Pulicaria dysenterica, is a common native British wildflower. it spreads via underground rhizomes and is easily dug up and divided in spring. it attracts a wide variety of insects including bees, hover flies and butterflies. 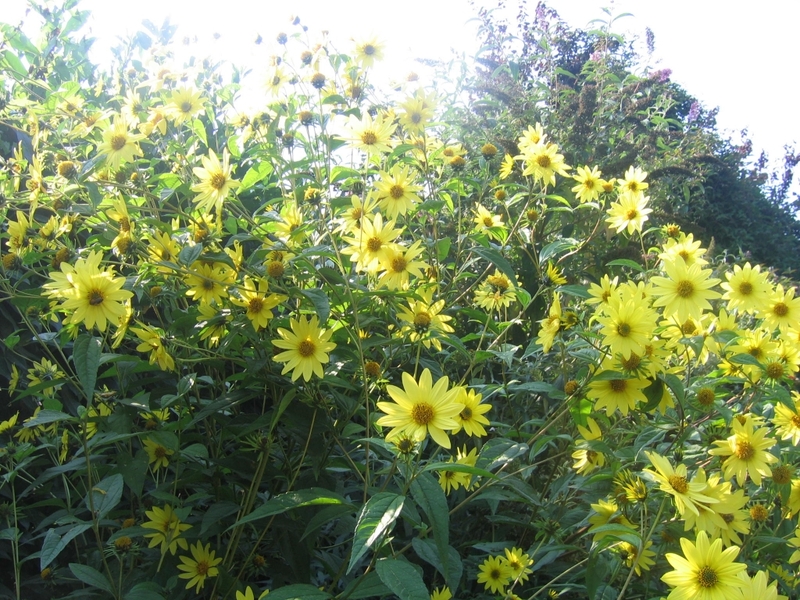 It can produce a mass of yellow flowers when planted in rough grassland or can be grown in a flower bed. it is a wildflower that could well be used more in gardens. 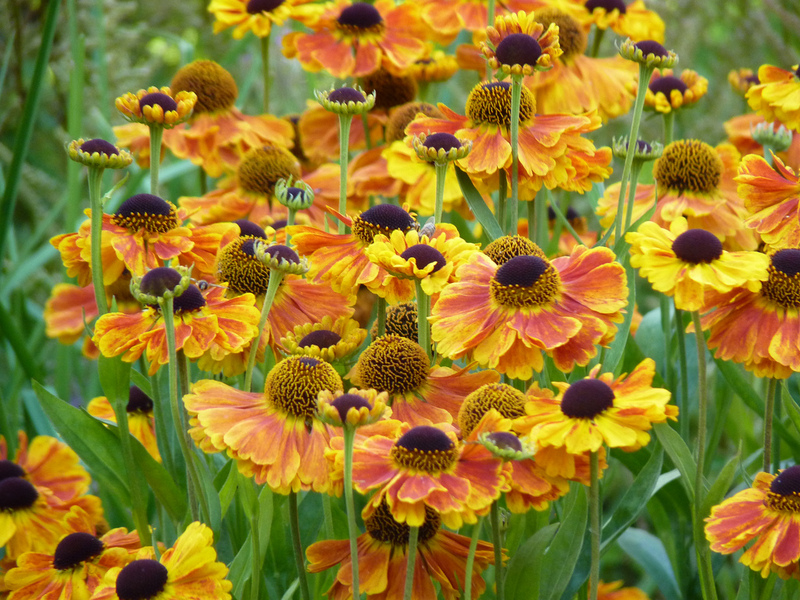 Helenium, Sahin’s Early Flowerer, is just one of many varieties of Helenium all of which have the same basic flower shape. Helenium is visited by a wide variety of insects including honey bees, bumble bees, wild bees, hover flies and butterflies. It is a herbaceous perennial which is normally able to survive the winter in the ground. 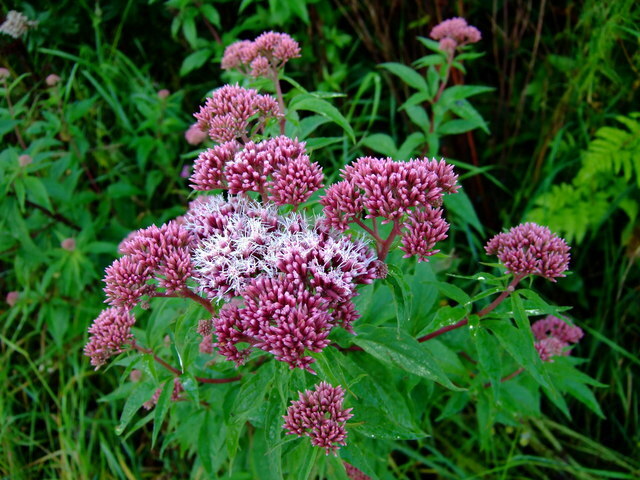 Hemp Agrimony, Eupatorium cannabinum, is a native British species. It is one of the best garden plants for butterflies and attracts a wide range of butterfly species. It also attracts many other insects including hover flies and honey bees. It is a perennial herb and is easy to grow and propagate in spring by division. The flowers are unusual in their colour and appearance. 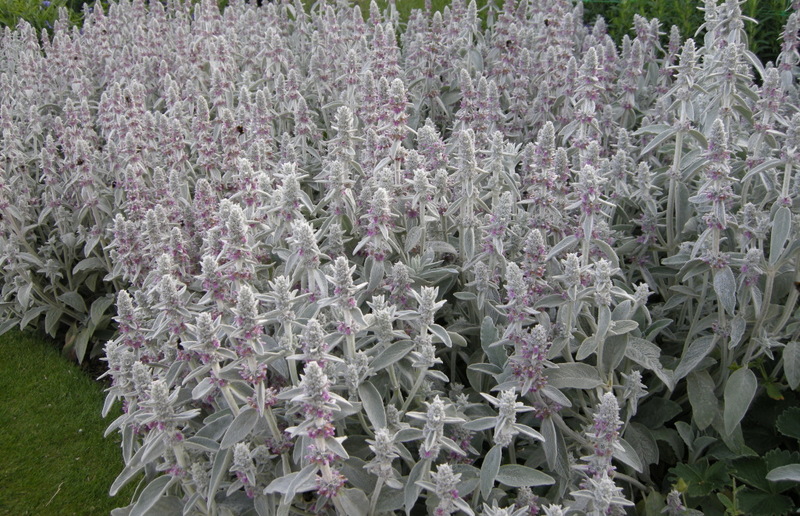 Lamb’s Ear, Stachys byzantia, is from Turkey and Iran. It is grown for ground cover due to its silver-haired leaves but also has attractive flowers. The flowers attract many types of bee. One bee species that is very often seen on Lamb’s Ear in summer is the wool carder bee. The male wool carder bees form a territory on a patch. They are large and aggressive and chase off other bees in order to mate with the females bees who forage on their patch. Lavender Lavandula x intermedia var. Grosso is a hybrid lavender. Hybrid lavenders grow into larger plants and attract more insects than the species lavenders such as Lavendula angustifolia and Lavendula stoechas. Lavender flowers attract mainly bumble bees but also honey bees, other bees, butterflies and hover flies. 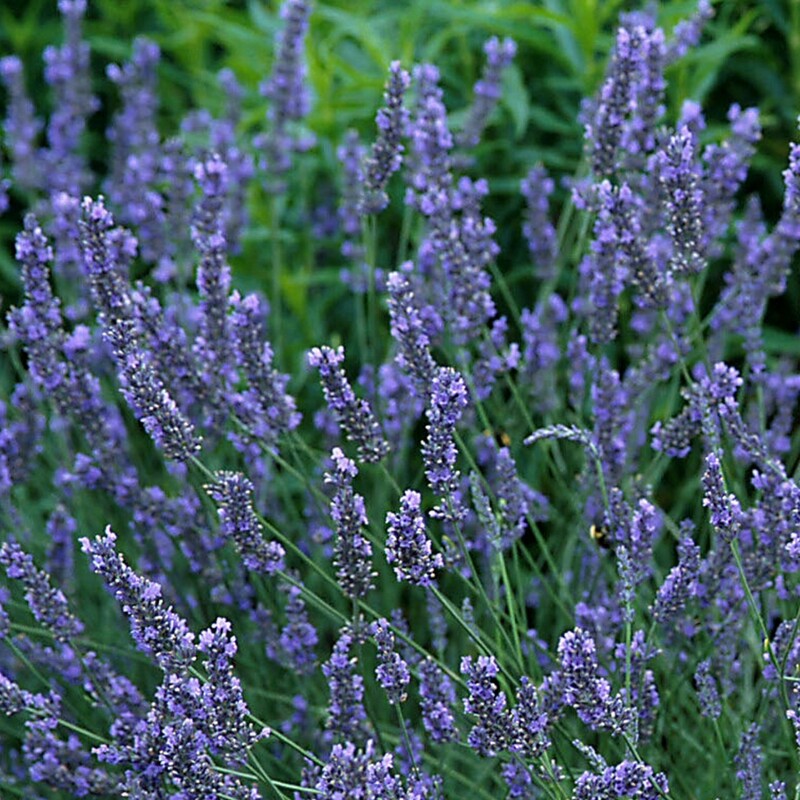 Lavender is a small shrub that lives many years and is easy to look after. 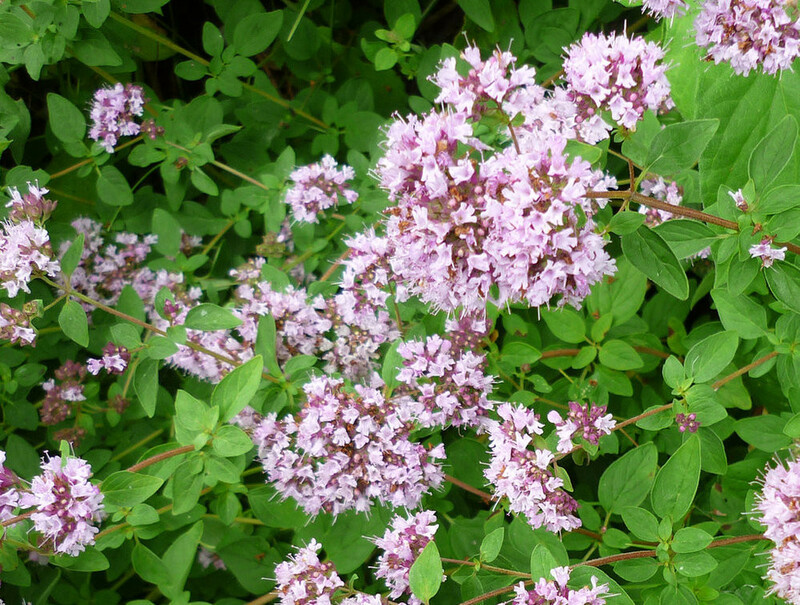 Marjoram, Origanum vulgare, is a native British species and is common on chalk downland. 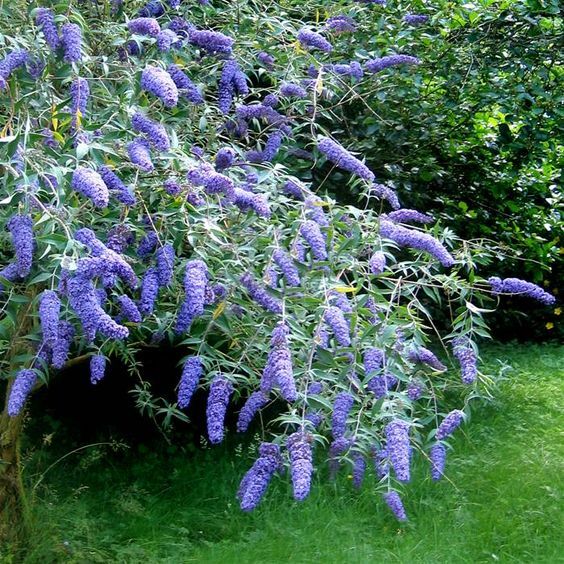 It is one of the very best garden plants for attracting insects as it attracts both large numbers and a good mix including honey bees, bumbles, wild bees, hover flies and butterflies. It is a perennial herb which spreads slowly and smothers weeds. It is easily propagated by division in spring. 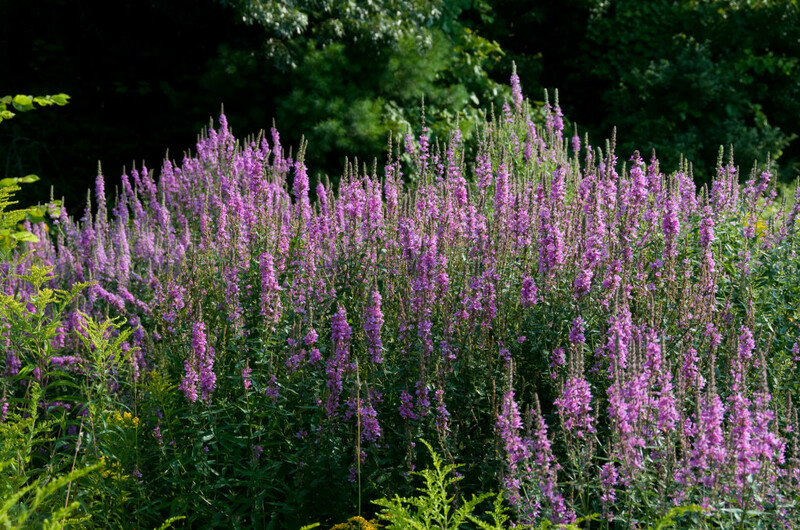 Purple Loosestrife, Lythrum Salicaria, is a native British wildflower usually found in damp areas, but will grow well in gardens even if not in a wet area. It attracts honey bees and other insects including hover flies and white butterflies. It is a perennial herb that can be propagated by division in autumn. It is easy to grow and produces masses of flowers. Helianthus are sunflowers. The variety “Lemon Queen” blooms for several months starting in August. It is easily propagated by dividing in spring. 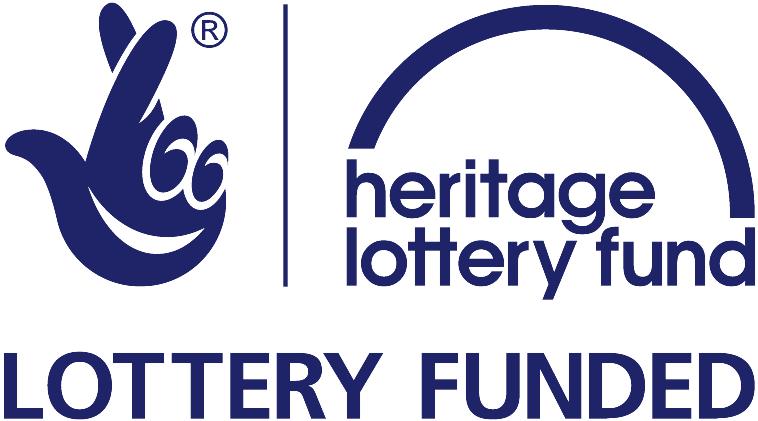 It attracts a wide range of insects including bees, hover flies and butterflies. It is one of the easiest and most impressive garden plants, growing 2 metres high and with a mass of flowers and attractive foliage. 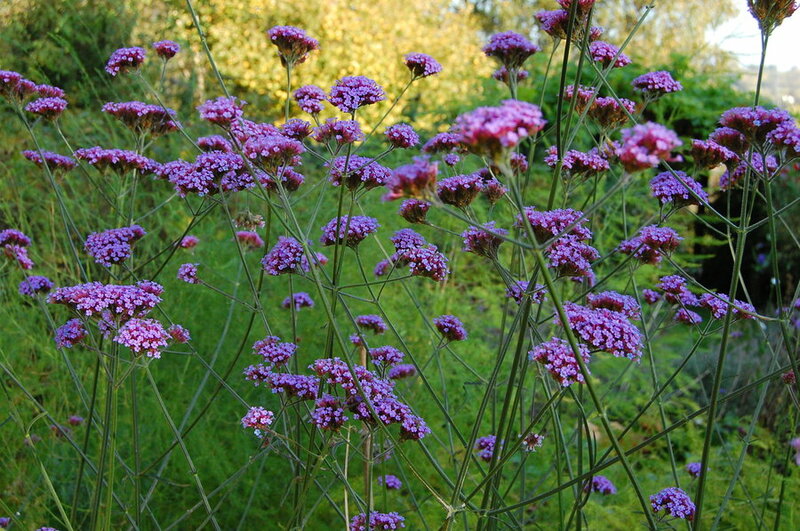 Verbena bonariensis is from Argentina. It is one of the best garden plants for butterflies but also attracts many other insects, especially hover flies. It is easily propagated by making cuttings and via seed. It will usually survive the British winter outdoors. It is a tall, elegant plant that grows rapidly. 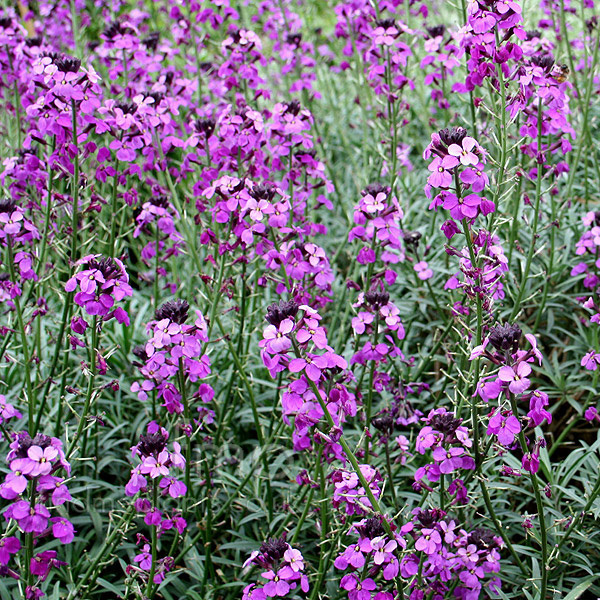 Bowles Mauve, Erysimum linifolium, is a type of wallflower. It is one of the best garden flowers for butterflies and also attracts honey bees, bumble bees, other bees, and hover flies. It is a small shrub that lives for about 2 years and can be propagated via cuttings. It is unable to set seed, so has an exceptionally long bloom period from April to November. Many garden plants have flowers that are not attractive to bees or other pollinating insects. 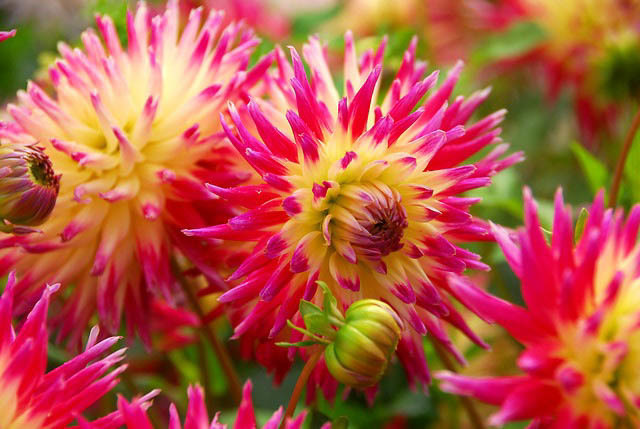 Among these are the Perlagoniums and several types of Dahlia. Look at these plants and you will quickly see how few bees or other insects visit them. Bee and pollinating insect friendly plants are just as cheap and pretty. 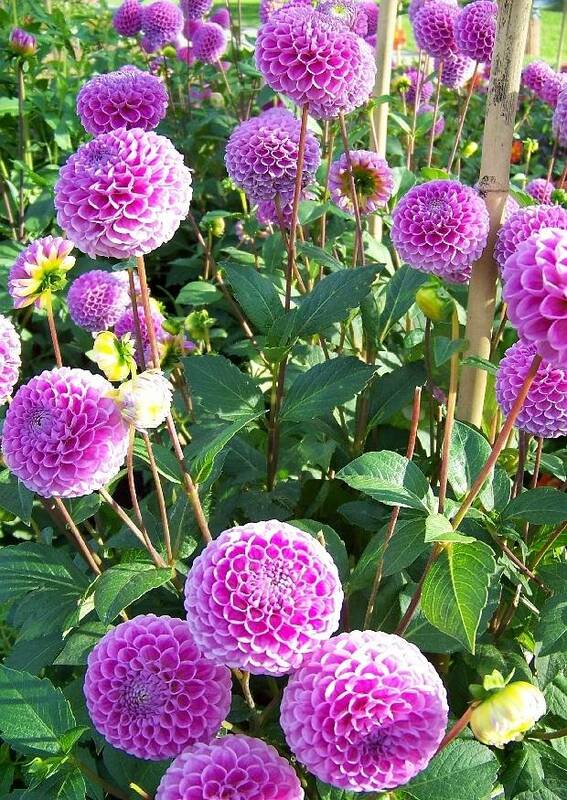 Dahlia’s with “Pom Pom” or “Cactus” flowers produce little or no pollen and nectar, or produce it in a way that is not accessible to insects.